Let us save you time and money with AMSOIL Synthetics! or shop online for AMSOIL at the AMSOIL Corporate Store by clicking the banner below. To order by phone, call 1-800-956-5695. Please provide the operator with 1290868 as your customer referral number. AMSOIL comes out on top when compared to 4 other popular 5W-40 diesel oils. 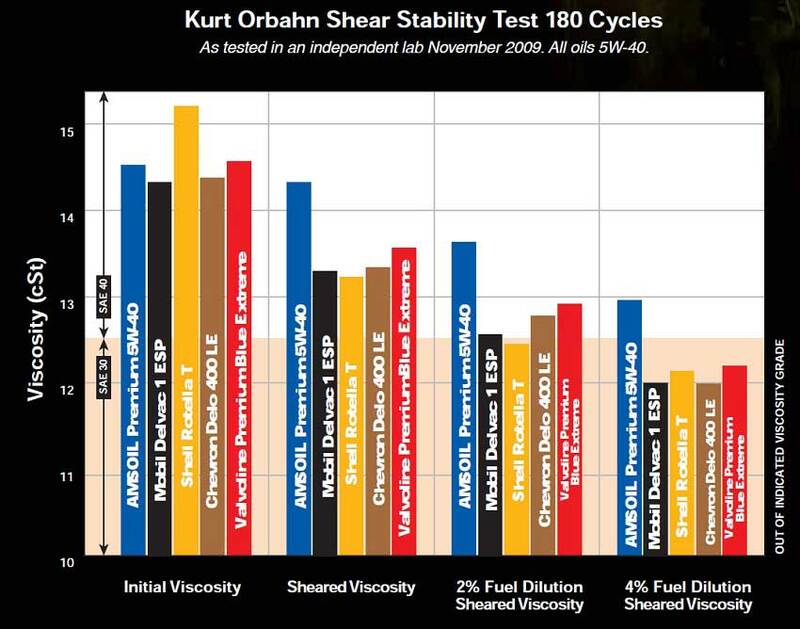 Even with 4% fuel dilution, AMSOIL's sheared viscosity was still able to stay within the SAE 40 grade, where all of the others decreased to SAE 30 grade. This is very important for diesel owners with 2007 and newer diesel engines because these models are known to suffer from additional fuel dilution. Change to a 160-degree Thermostat - In order to meet EPA fuel economy and emissions, vehicle manufacturers are forced to run engines hot with oil and coolant temperatures in excess of 200+ degrees. One of the problems with this is that most engine heads are made of aluminum which expands much more than cast iron. By increasing the temperature range of the engine from cold to hot, and ultimately the amount of aluminum expansion and contraction, there is a significant increase in the chances of blowing a head gasket over time. Please note that this change may reduce fuel economy slightly. Use Synthetic Transmission Fluid in Automatics - High transmission temperatures can greatly impact the longevity of automatic transmissions, particularly the internal clutches. A synthetic transmission fluid can provide better protection and lubrication at higher temperatures without breaking down, which is especially important if you do lots of towing or hauling. Synthetic transmission fluids also reduce friction of internal valves and solenoids providing better shifting performance. It can also improve fuel mileage slightly. Get Your Vehicle Professionally Tuned or DIY - Factory ECM (Engine control management) settings are often times very conservative in terms of ignition timing advance, and AFRs (air-fuel ratios) at WOT (wide-open throttle). This is especially important if you have added or are planning to add a higher-flowing air intake system. We have found that some vehicles are severely de-tuned from the factory at the higher airflow rates beyond what the OEM air system flows. This is why some people have experienced decreased performance when adding a cold-air intake system to their vehicle. The ECM will actually retard the ignition timing at the higher air-flow rates, thus reducing engine power significantly at full throttle. Please note that high-performance cars are usually better tuned from the factory and may not see as much gains. For GM vehicles, we use HPTuners available at www.hptuners.com. Use Fuel Injection Cleaner Periodically - We recommend using fuel injection cleaner quarterly (once every 3 months) to help maintain your fuel system. We hate to brag, but AMSOIL's P.I. Performance Improver gasoline additive is an amazing product. It's about the only product we've ever used that provides a noticeable increase in performance and fuel mileage when added to a tank of fuel. Be sure to try it out with your next oil change. If you're really tuned in to your car, we think you'll be impressed. Clean/Inspect Your Air Filter - A reduction in air-flow through your air filter will reduce engine power, and require more engine throttle to achieve/maintain your speed, thus reducing fuel economy and performance. Inflate Your Tires - We know you've been told a thousand times to do this, but it is still very important for fuel economy and safety. Change Your Fuel Filter - We recommend changing your fuel filter annually. Any reduction to fuel pressure can reduce your fuel injectors performance and ability to atomize the fuel optimally. Increased backpressure can also shorten the life of your fuel pump. We also recommend keeping at least a quarter-tank or more in your fuel tank. The fuel in your gas tank is what keeps your electric fuel pump cool. Accelerate/Decelerate Gradually - For maximum fuel economy, this does help. Tailgating - We don't recommend tailgating, but there are significant gains in fuel economy by following other vehicles. Some studies using computer controlled vehicles following extremely closely to one another have shown gains of 30+ %. We'd like to reiterate that safety is far more important than fuel economy or performance so please drive responsibly. We recently went shopping to compare the prices of other leading extended-drain synthetic motor oils. Mobil 1's extended drain 15,000 mile oil was going for $9.19/qt. A premium oil filter such as the K&N Gold oil filters retail for $12.99 each. Most consumers will need to purchase 6 quarts of oil and a filter to allow for topping off during the extended drain interval. So, $9.19 x 6 quarts + $12.99 for a filter is going to run $68.13 plus tax, or about $72 on average. For just a little more, you can have a superior AMSOIL 25,000 mile synthetic motor oil and premium AMSOIL oil filter delivered right to your door. Request a free price quote using the form on our AMSOIL ordering page to see how much you could be saving. AMSOIL sold here. If you're looking to buy AMSOIL, you've come to the right place. This is the only AMSOIL dealer website where ordering is fast and easy, and your satisfaction is guaranteed. AMSOIL Inc. does not permit any Amsoil dealer to post prices on the web. As a result, we encourage you to visit our AMSOIL Ordering page and request a free price quote. It's quick and easy. Just look up the part numbers you need and fill out the form. You'll get a response in under 30 minutes during our regular hours. If you're not sure what you need, please contact us! You can also buy AMSOIL at retail prices by visiting the Amsoil Online Store. However, you should consider becoming a preferred customer (save 15-30%) if you decide to buy directly from Amsoil. Be sure to contact us for special offers if you are considering becoming an Amsoil preferred customer or Amsoil dealer. Maximize your profits or minimize your costs by going through us. We realize that AMSOIL isn't cheap, and we do our best to offer it at affordable prices. All AMSOIL dealers pay the same price, so be sure to shop around to get the best price on AMSOIL. By using the form on our AMSOIL ordering page, you can request a free price quote and place an order in under 10 minutes. That is as good of service as you will find anywhere. Ordering directly from AMSOIL isn't going to get the products to you any quicker than ordering from us. When we receive orders, we have the products drop-shipped to your door from the AMSOIL warehouse nearest you, which is the same thing that happens when you place orders at the AMSOIL Online Store. Therefore, why shop anywhere else? You get fast convenient ordering, and the quickest shipping possible all right here. AMSOIL is money well spent! We would like to thank all of our customers for making this one of the best, if not the best AMSOIL site on the web. Thank you all for the great feedback and support. We look forward to serving all of your AMSOIL needs now and well into the future. As always, we'll be striving to provide the best service possible.